Slovenia was first an independent nation at the Olympic Games in 1992. They have been in every Games since then. Prior to the breakup of Yugoslavia, Slovenian athletes were part of Yugoslavia at the Olympics. The National Olympic Committee for Slovenia was formed in 1991 and recognized in 1993. Slovenian athletes have won a total of fifteen medals at the Summer Olympic Games and another seven at the Winter Olympic Games. Rajmond Debevec competed at the Olympics eight times and won three medals, including one gold. 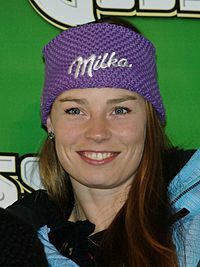 Tina Maze won four Olympic medals, including two gold. ↑ "Rowing at the 1992 Barcelona Summer Games: Men's Coxless Pairs". Sports Reference. Retrieved 2016-08-17. ↑ "Rowing at the 1992 Barcelona Summer Games: Men's Coxless Fours | Olympics at". Sports Reference. Retrieved 2016-08-17. ↑ "Athletics at the 1996 Atlanta Summer Games: Women's 100 metres Hurdles | Olympics at". Sports Reference. Retrieved 2016-08-17. ↑ "Canoeing at the 1996 Atlanta Summer Games: Men's Kayak Singles, Slalom | Olympics at". Sports Reference. 1996-07-28. Archived from the original on 2016-08-16. Retrieved 2016-08-17. ↑ "Rowing at the 2000 Sydney Summer Games: Men's Double Sculls | Olympics at". Sports Reference. Archived from the original on 2016-03-04. Retrieved 2016-08-17. ↑ "Shooting at the 2000 Sydney Summer Games: Men's Small-Bore Rifle, Three Positions, 50 metres | Olympics at". Sports Reference. 2000-09-23. Retrieved 2016-08-17. ↑ "Rowing at the 2004 Athina Summer Games: Men's Double Sculls | Olympics at". Sports Reference. Retrieved 2016-08-17. ↑ "Athletics at the 2004 Athina Summer Games: Women's 800 metres | Olympics at". Sports Reference. Retrieved 2016-08-17. ↑ "Judo at the 2004 Athina Summer Games: Women's Half-Middleweight | Olympics at". Sports Reference. 2004-08-17. Retrieved 2016-08-17. ↑ "Sailing at the 2004 Athina Summer Games: Mixed One Person Dinghy | Olympics at". Sports Reference. Archived from the original on 2016-03-18. Retrieved 2016-08-17. ↑ "Athletics at the 2008 Beijing Summer Games: Men's Hammer Throw | Olympics at". Sports Reference. Archived from the original on 2016-08-03. Retrieved 2016-08-17. ↑ "Sailing at the 2008 Beijing Summer Games: Men's One Person Dinghy | Olympics at". Sports Reference. Archived from the original on 2016-06-04. Retrieved 2016-08-17. ↑ "Swimming at the 2008 Beijing Summer Games: Women's 200 metres Freestyle | Olympics at". Sports Reference. Retrieved 2016-08-17. ↑ "Judo at the 2008 Beijing Summer Games: Women's Heavyweight | Olympics at". Sports Reference. 2008-08-15. Retrieved 2016-08-17. ↑ "Shooting at the 2008 Beijing Summer Games: Men's Small-Bore Rifle, Three Positions, 50 metres | Olympics at". Sports Reference. 2008-08-17. Retrieved 2016-08-17. ↑ "Judo at the 2012 London Summer Games: Women's Half-Middleweight | Olympics at". Sports Reference. 2012-07-31. Retrieved 2016-08-17. ↑ "Athletics at the 2012 London Summer Games: Men's Hammer Throw | Olympics at". Sports Reference. Retrieved 2016-08-17. ↑ "Rowing at the 2012 London Summer Games: Men's Double Sculls | Olympics at". Sports Reference. Archived from the original on 2016-08-16. Retrieved 2016-08-17. ↑ "Shooting at the 2012 London Summer Games: Men's Small-Bore Rifle, Prone, 50 metres | Olympics at". Sports Reference. 2012-08-03. Retrieved 2016-08-17. ↑ "Women −63 kg". Rio2016.com. 2016-05-21. Archived from the original on 2016-08-20. Retrieved 2016-08-22. ↑ "Kayak (K1) Men". Rio2016.com. 2016-05-21. Archived from the original on 2016-08-25. Retrieved 2016-08-22. ↑ "Finn Men". Rio2016.com. 2016-05-21. Archived from the original on 2016-09-17. Retrieved 2016-08-22. ↑ "Women −78 kg". Rio2016.com. 2016-05-21. Archived from the original on 2016-08-26. Retrieved 2016-08-22. ↑ "Alpine Skiing at the 1994 Lillehammer Winter Games: Women's Combined | Olympics at". Sports Reference. Archived from the original on 2016-03-05. Retrieved 2016-08-17. ↑ "Alpine Skiing at the 1994 Lillehammer Winter Games: Men's Slalom | Olympics at". Sports Reference. 1994-02-27. Archived from the original on 2016-02-22. Retrieved 2016-08-22. ↑ "Alpine Skiing at the 1994 Lillehammer Winter Games: Women's Slalom | Olympics at". Sports Reference. 1994-02-26. Archived from the original on 2016-08-20. Retrieved 2016-08-17. ↑ "Ski Jumping at the 2002 Salt Lake City Winter Games: Men's Large Hill, Team | Olympics at". Sports Reference. 2002-02-18. Archived from the original on 2016-03-04. Retrieved 2016-08-17. ↑ "Alpine Skiing at the 2010 Vancouver Winter Games: Women's Super G | Olympics at". Sports Reference. Retrieved 2016-08-17. ↑ "Alpine Skiing at the 2010 Vancouver Winter Games: Women's Giant Slalom | Olympics at". Sports Reference. Retrieved 2016-08-17. ↑ "Cross Country Skiing at the 2010 Vancouver Winter Games: Women's Sprint | Olympics at". Sports Reference. 2010-02-17. Retrieved 2016-08-17. ↑ "Alpine Skiing at the 2014 Sochi Winter Games: Women's Downhill | Olympics at". Sports Reference. 2014-02-12. Archived from the original on 2016-03-06. Retrieved 2016-08-17. ↑ "Alpine Skiing at the 2014 Sochi Winter Games: Women's Giant Slalom | Olympics at". Sports Reference. 2014-02-18. Archived from the original on 2016-03-05. Retrieved 2016-08-17. ↑ "Ski Jumping at the 2014 Sochi Winter Games: Men's Normal Hill, Individual | Olympics at". Sports Reference. Retrieved 2016-08-17. ↑ "Snowboarding at the 2014 Sochi Winter Games: Men's Parallel Slalom | Olympics at". Sports Reference. 2014-02-22. Retrieved 2016-08-17. ↑ "Cross Country Skiing at the 2014 Sochi Winter Games: Women's Sprint | Olympics at". Sports Reference. 2014-02-11. Retrieved 2016-08-17. ↑ "Biathlon at the 2014 Sochi Winter Games: Women's 10 kilometres Pursuit | Olympics at". Sports Reference. 2014-02-11. Retrieved 2016-08-17. ↑ "Ski Jumping at the 2014 Sochi Winter Games: Men's Large Hill, Individual | Olympics at". Sports Reference. Retrieved 2016-08-17. ↑ "Snowboarding at the 2014 Sochi Winter Games: Men's Parallel Giant Slalom | Olympics at". Sports Reference. 2014-02-19. Retrieved 2016-08-17. "Olympic Committee Of Slovenia Association of Sport". International Olympic Committee. Retrieved 2011-12-22. This page was last changed on 10 December 2018, at 19:22.